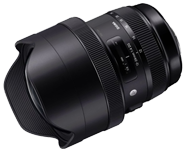 Announced in September 2016, the Sigma 12-24mm f/4 DG HSM A (Sigma 12-24mm f/4 A) is a wide-angle zoom for full-frame DSLRs available in Nikon, Canon, and Sigma lens mounts. This review considers the performance of the Nikon-mount version. Sitting in Sigma’s high-end lineup of “Art” lenses, the $1499 Sigma 12-24mm f/4 A offers an advanced optical construction with 16 elements, including 3 aspherical; 2 super-low dispersion (SLD); and 2 new “F” low dispersion (FLD), which are engineered to offer similar performance to the fluorite elements now included in some new Nikon lenses (such as the 70-200mm f/2.8E). Taking aim squarely at the Canon EF11-24mm f/4L USM, this new 12-24mm f/4 lens from Sigma is part of its “Art” range of lenses. These lenses are designed to offer the optimum image quality possible without worrying about the normal compromises of cost, size or weight, and they are advertised as perfect for today’s range of ultra-high resolution camera sensors, where lens performance is more closely scrutinized than ever before — any degradation in performance will show up quickly and clearly.